Too Little Time: Socks on Circs. I tried to teach myself socks on circulars with little progress and lots of knotted yarn. So I broke down and looked for help. One class in my available time was full. No others were offered. Undaunted, I booked a private lesson. So, Today I learned socks on circs. Not so bad - I have 1/2 inch of cuff #1 done (yea yea big deal) however, no knoted yarn and progress can be seen. Unfortunatly, I have to work tonight so progress won't be seen tonight either. However, Most Importantly - I GET IT!! Soon I will be 2 at a timing it! 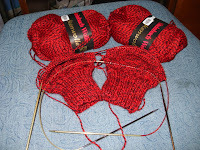 By-the-by, purchased addi turbo's -- nice -- also Addi Lace Needles - AWESOME!! - Currently using one of each because they are differnt colors and easier to tell if I have the right needle in my hand. April 20 - Is spring here?